Ordinary video clips have three channels of information for red, green, and blue. An alpha channel is an additional channel that defines areas of transparency in the clip or image. 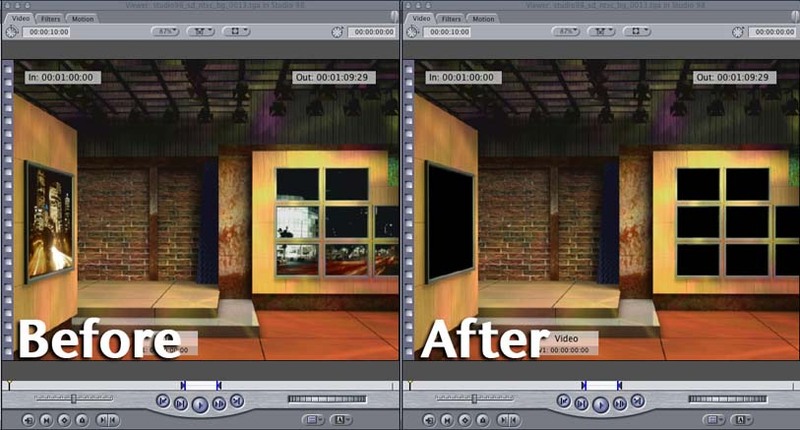 If you import a QuickTime movie or a still image from another application, or a file that’s been created by a 3D animation program, it may have an alpha channel in addition to its color channels. An alpha channel is a grayscale channel where levels of white and black determine varying degrees of transparency applied to the color channels during compositing. When you import a QuickTime movie or an image file, its alpha channel is recognized immediately. 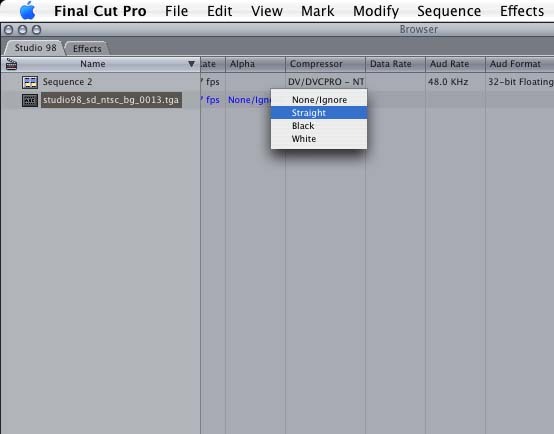 When you edit the movie or image file into a sequence, Final Cut Pro uses the alpha channel to composite the movie or image file against any clips appearing in video tracks below it. Note: Alpha channels work the same in video and still-image media files. Important: When you import a clip with an alpha channel that contains no data, the clip appears white. To display the clip properly, change the alpha channel for the clip to None (see Changing a Clip’s Alpha Channel Type). Welcome to the world of Virtual Sets. You are now ready to make your life easier by adding exciting and visually stunning backgrounds to your chromakey footage. Let's take a look at how easy it is to get up and running with your new sets! We're going to assume that you already have a good grasp on how to chromakey in Final Cut Pro, and we're going to focus on the other important element in your shot, the background. 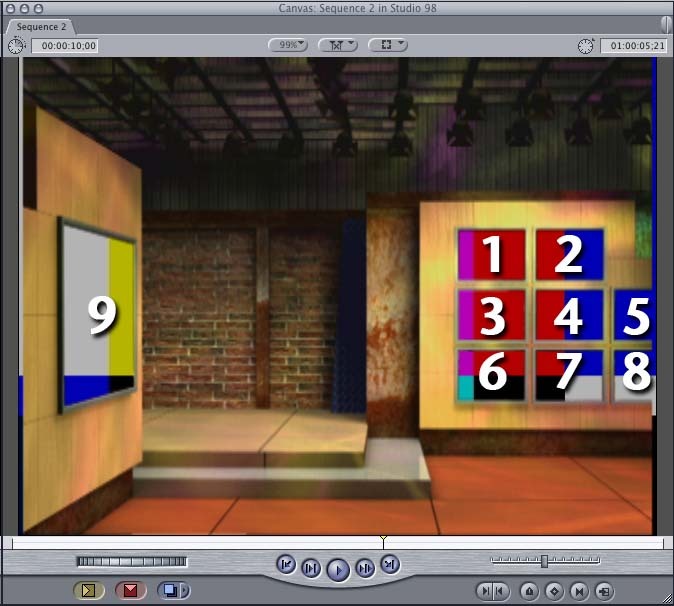 For our tutorial, we're going to use virtual set "Studio 98", but the overall idea can be applied to any of our virtual sets. Let's take a look at one of the more complex sets that has a few background elements we need to adjust. 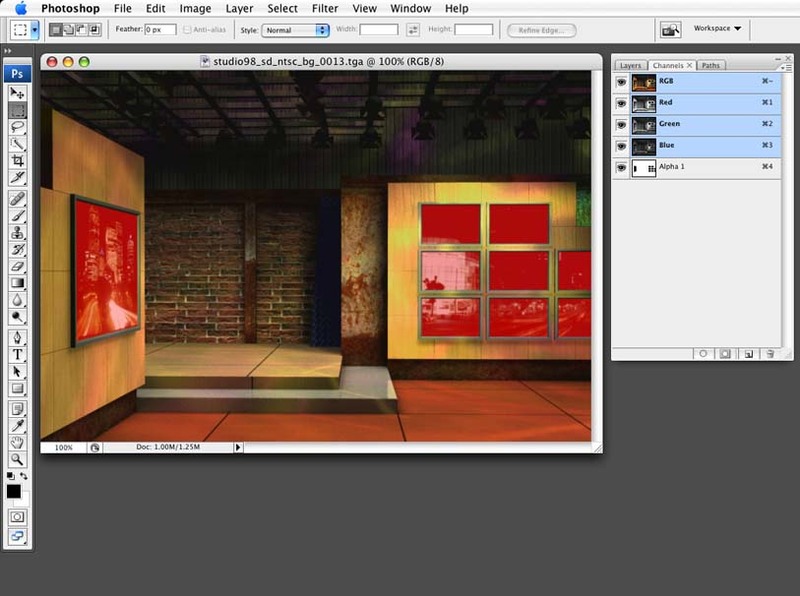 As you can see when looking at one angle of "Studio 98" in Photoshop, there are matte elements that have been added to make it quick and easy to add elements in where the keys are. This shot is a great example to use as there are nine elements that need to be added to our shot. Launch Final Cut Pro, and once the application is open, you can import the desired image (the matted version) into Final Cut Pro by simply dragging it from your desktop into your project window, or by navigating to FILE>IMPORT>FILES. Something very important to keep in mind is that if you import one of our images that has a matte attached to it, and you do not see it in Final Cut Pro, there is a quick way to activate it. 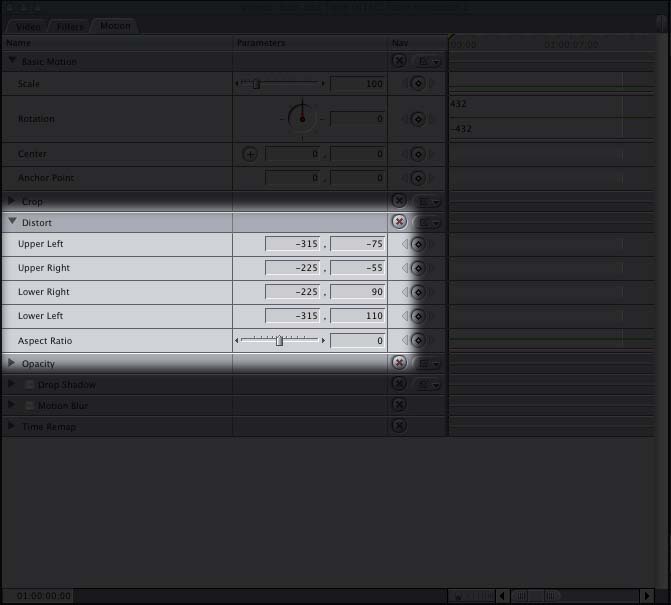 In the Project window, simply navigate to your "Alpha" column, and change the alpha from "None/Ignore" to "Straight", and anywhere the virtual set has a matte, it will turn black. Now that our matte is activated, we are ready to put our footage into our shot. 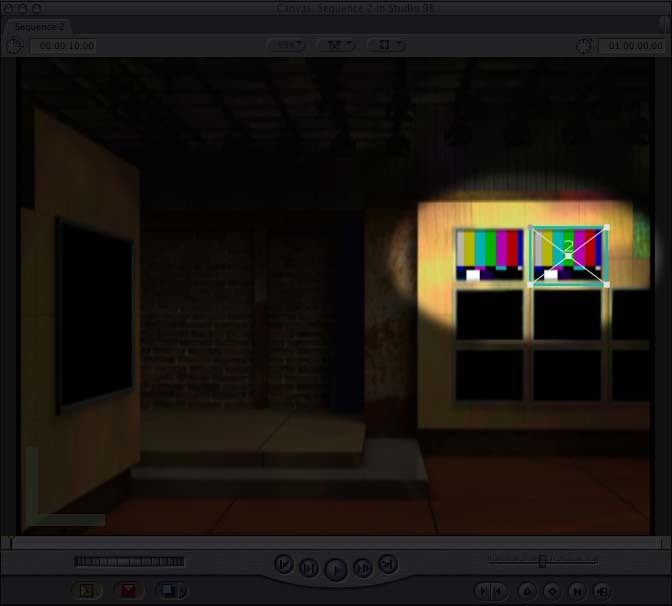 For the purposes of this tutorial, we are going to use Color Bars as our clip for all of our television monitors. We want to have different images in each monitor, and since we have nine monitors, we are going to need ten layers. 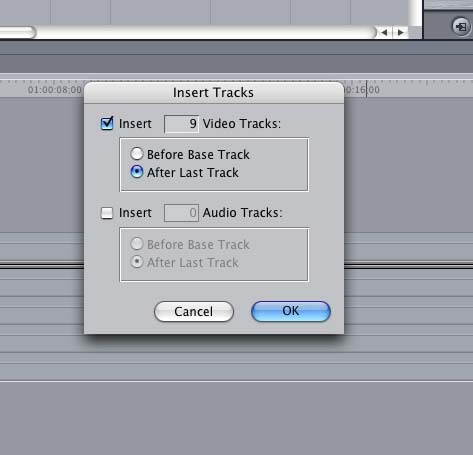 Nine for our monitor images, and one for the set, so create ten layers in Final Cut Pro by either right clicking on the video portion of your timeline and selecting "Add Track" or navigate to SEQUENCE>INSERT TRACKS, and add the appropriate amount of tracks so that you have ten in total. Now that we have our ten video tracks, we are going to add our set element to the top most track (V10). 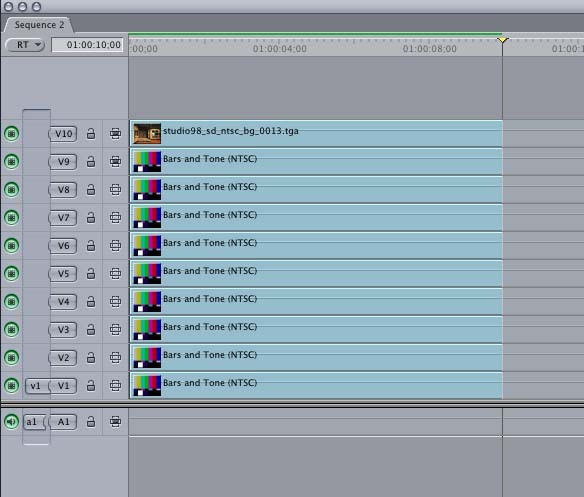 Next, we are going to edit in Color Bars to the first nine tracks so we have all the footage we need to create our shot. We are now ready to resize all our footage to fit in our monitors. We will start with the small, upper-left monitor, and work our way from left to right from there, with the large monitor being the last layer (V9) that we manipulate. To make your job easier, you might want to disable the clips that you are not working with, so that only one is visible at a time. You can do this by selecting the clips you don't want to see, right click on them, and deselect "Clip Enable". Now that we have one clip visible, we can manipulate it quite easily to fit into monitor #1. Double click on the video in V1, and select the "Motion" tab from your "Viewer" window. Adjust the "Scale" of the image to "12", and the "Center" to "175.2, -40.17". As you can see, the image now sits perfectly in monitor #1. To adjust the next clip (V2), select the clip, right click on it and select "Clip Enable" to enable it. 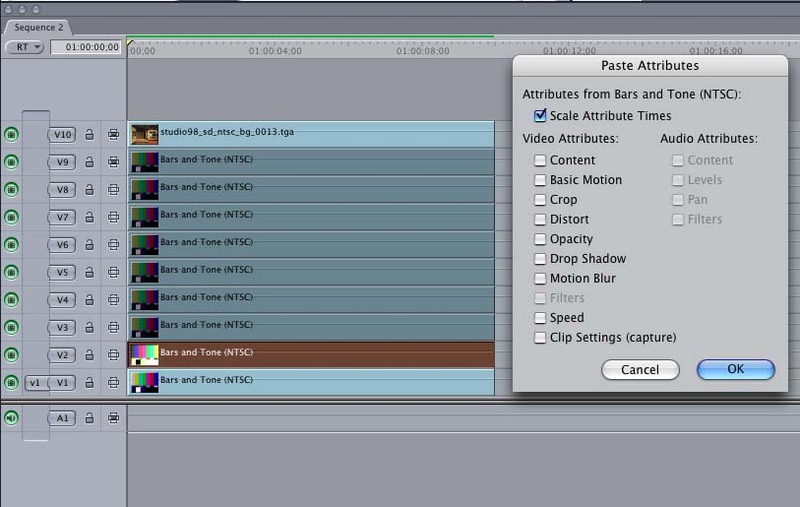 Now, we are going to copy and paste the attributes from the first clip to the second clip. To do this, select the clip on "V1", and press CMD+C to copy the clip's attributes. Now, select the clip on "V2", and press OPT+V. You will now see this window. Since the parameter we want is "Basic Motion" (as both Scale and Center fall into that category), select that check box, and press "OK". 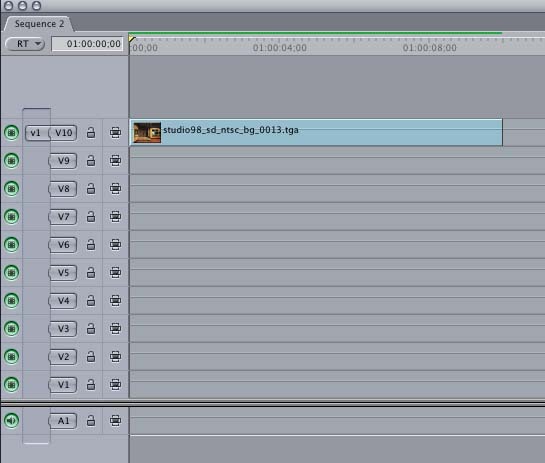 You will immediately see that your clip has taken on the parameters of the first clip's "Scale" and "Center" position. Now all we need to do is position the clip behind the second monitor. 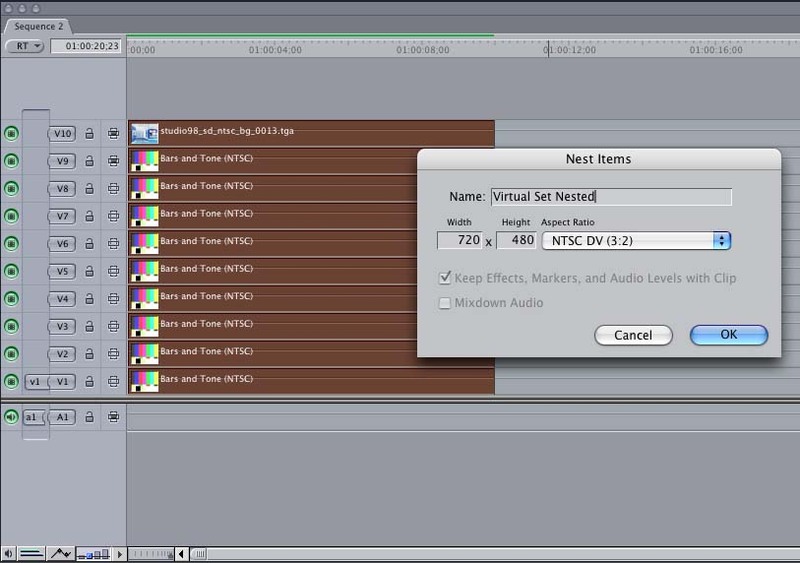 You can now repeat this technique for the other six monitors. For the last, larger monitor, the technique we will use is a little bit different. 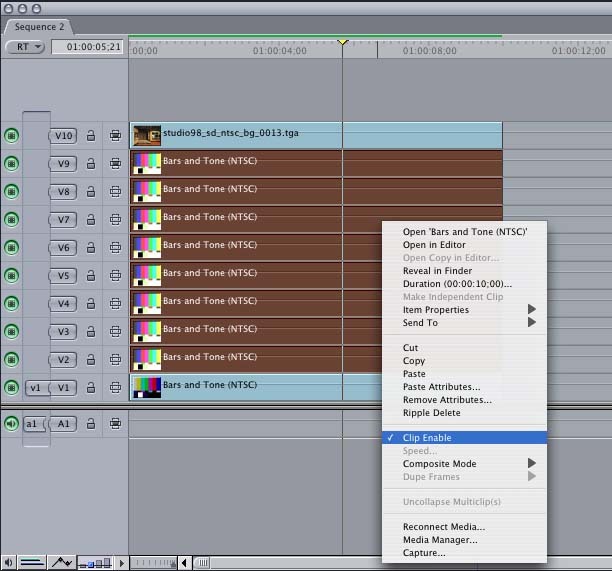 Select the clip on "V9", double click on it to bring it up in the viewer, and select the "Motion" tab. Since this monitor's perspective is different from the other monitors, we are going to use the "Distort" parameter to give our last clip the proper perspective, so that it looks correct. Here are the parameters you need to input to create the proper perspective on your large monitor. If you happen to have a Corner Pin third-party plug-in for Final Cut Pro, you apply that effect to this layer, and quickly drag-and-drop your corners where you want them. Finally, many editors find it difficult to work with ten layers in Final Cut Pro, so to clean up your timeline, you can nest all ten of your compositing layers into one layer by selecting them all, and pressing OPT+C to nest them down to one layer. 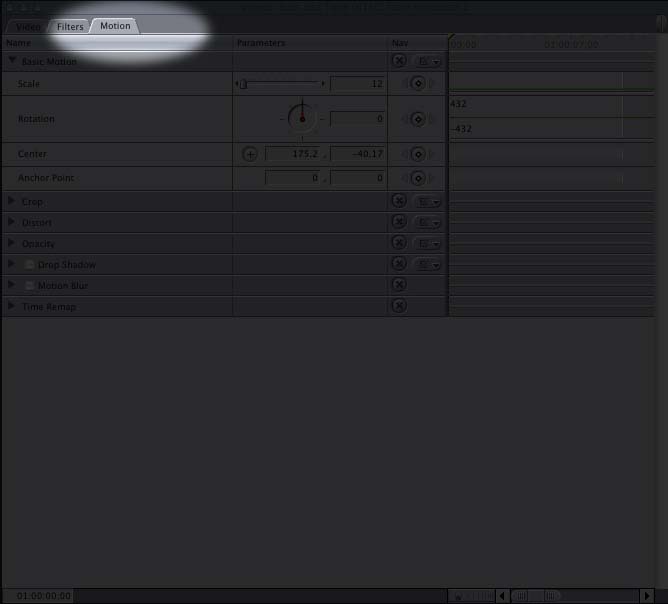 If you need to adjust any one of your layers at a later time, simply double click on the nest layer to access all the individual layers. Your background element should look like this. To add your talent to the background element you have created, simply insert the footage onto "V2", add your chromakey effect, and adjust the key, scaling and position to your liking to create a realistic looking image. One final thought to keep in mind is that many of our virtual sets come with foreground elements like desks and other set pieces you might want to add into your shots. To do that, the same technique applies, just remember that since they will be located in the foreground, you will want them to be on your top most layer. Happy chromakeying!